On Dec. 15, teams throughout the NBA will be able to trade their summer free agent acquisitions with the Los Angeles Lakers expected to be one of the major players to make a move. The Lakers got off to a rough start to the season, but remained patient with their young core as LeBron James willed them to victories to get them above .500. 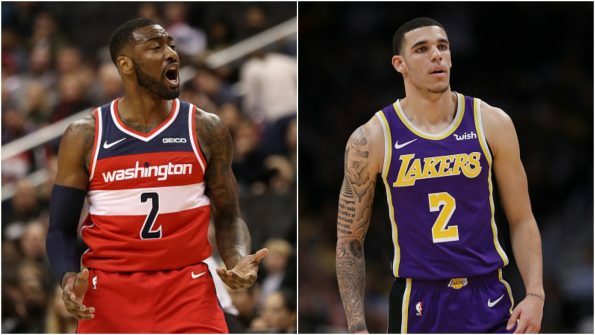 Things have changed and now they’re looking to pair James with five-time All-Star John Wall and Lonzo Ball could be a casualty of that trade. Source No. 1, a current NBA agent, surprised me by saying the story was true. The source said it’s something Rich Paul — agent to LeBron James and, as of January 2016, John Wall — was orchestrating. But, according to this source, the Wizards were saying no. I was still dubious, so I checked with Source No. 2, another current NBA agent who’s at least as dialed in as Source No. 1. Source No. 2 said the rumor is true. This source said Ball and Caldwell-Pope were definitely in the deal, but that there was still discussion whether the third player would be Ingram, Josh Hart, or Kyle Kuzma. While the boundaries of the deal were defined, details still had to be finalized, and the whole thing could still fall apart. It was just last summer when John Wall signed an extension with the Wizards that will pay him a total $207 million through 2023. Wall is an extremely talented player, but that is a boatload of money, and if the Lakers believe the risk is worth the possible reward, then they’ll definitely pull the trigger.